No one seriously interested in the character of public knowledge and the quality of debate over American alliances can afford to ignore the complex link between press and policy and the ways in which mainstream journalism in the U.S. portrays a Third World ally. 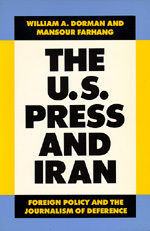 The case of Iran offers a particularly rich view of these dynamics and suggests that the press is far from fulfilling the watchdog role assigned it in democratic theory and popular imagination. William A. Dorman is Professor of Journalism at California State University, Sacramento. Mansour Farhang, who was revolutionary Iran's first ambassador to the United Nations, is now Professor of Politics at Bennington College.